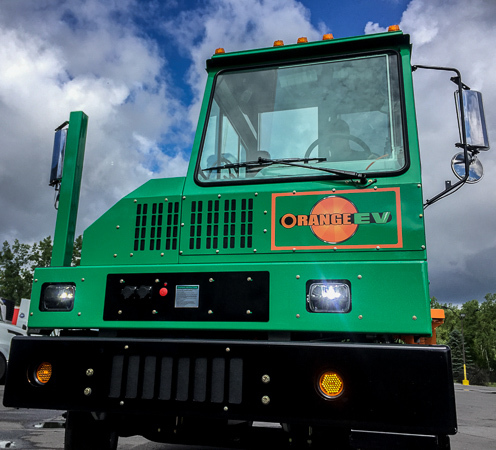 Orange EV trucks are safer for operators, technicians, site personnel, and the surrounding community. Orange EV’s patent-pending technology represents an innovation over existing electric-powered Class 8 vehicle systems, delivering increased safety and energy efficiency. Add the comfortable, emission-free environment and it's clear why Orange EV trucks are preferred by drivers and management alike. Orange EV trucks run on voltages less than 120V DC (direct current) which is significantly lower and safer than the 350V DC to 450V DC used by other vehicle manufacturers. Generally safer than AC (alternating current), 120V DC is lower than voltages commonly found in residential homes. Orange EV’s T-series are emission-free, eliminating the hazards associated with inhaled diesel emissions thereby safeguarding personnel. Also, with no emissions and reduced noise, Orange EV trucks can be safely used indoors. With no diesel, motor oil, or glycol, liquid spills are rare. This eliminates common sources of slips and injury and minimizes the costs associated with spill readiness, cleanup, and fines. Drivers enjoy heating in the winter and cooling in the summer provided by systems that respond immediately and deliver maximum output within seconds. Orange EV's optional ignition lock prompts drivers to engage the seatbelt.